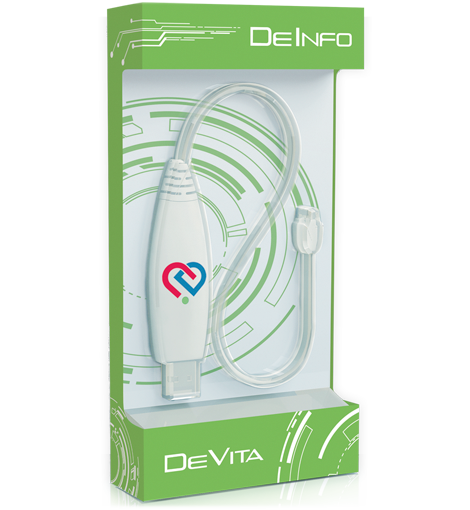 The DEINFO USB device allows you to input new frequencies and therapy programmes onto your DEVITA AP and DEVITA RITM devices. There are over 3,000 frequencies to choose from, covering a large array of microorganisms as well as organ pathologies covering most diseases known to medicine. The DEINFO USB has about 1,500 programmes for the DEVITA AP and another 1,500 for the DEVITA RITM. It automatically recognises which device it is as soon as you plug the device in, and will only show programmes for that device only. The DEINFO USB can be updated online for free – updates are available a few times per year. DEINFO does not require installation on your computer and when it is plugged into your computers USB slot it is immediately recognized as a flash drive. It works on the following operating systems Windows XP; Windows Vista; Windows 7; Windows 8 and 10. It will not work on Macs. DEINFO will automatically recognize whether the DEVITA AP or DEVITA RITM is connected to it and will adjust its database to that device automatically. DeInfo has an extremely high level of information security: 2265 bit encryption. Therefore, the devices’ software and database can be safely upgraded via the Internet. You are able to fully customize a large number of new programs for the DEVITA RITM by changing the run time for programmes to suit adults, children, infants and the elderly. The patients’ data and their medical histories are securely stored in the application’s archive. Check out the training webinar below that takes you through the use of the DEINFO USB software and guides you in its proper use and setup. All you need to do is insert the flash-drive into the USB port and immediately start using it.